This blog is about the story of international marriage couple (Japanese lady and Filipino male couple). We love each others but it does not mean that we accept and feel comfortable to all of our differences. It surely takes time to reach the certain level of feeling accepting and being accepted..comfortable. And this blog also describe the life in the Philippines. I hope you enjoy my stories. In general, Filipino are born entertainer. Amazingly, many of them know how to sing, dance and so on. I am always amazed at their performance. Every weekend, I was forced to listen songs from neighboring houses. From this, I realized not all of them are good singers :) but still their whole weekend videoke party shows they know a lot of songs. For me, they are human juke-box music. We, Japanese also like to sing a song. In facet, karaoke was born in Japan. But we sing inside the room with soundproof and we do not dance much. My Japanese friends tried to join Filipino dancing together however, movement is not smooth as Filipino does. I often observe people dance to entertain guests and audiences in public place. In the shopping mall, workers all of sudden started to dance. In someone's youtube video, flight attendant danced when they gave passengers safe-instruction. Prisoners in Cebu, dances in front of visitors of prison. They have several dance numbers. My nieces like dancing. I shoot video of their occasional "dance show". They enjoy watching these videos later on. Even profession far from performing art do dance such as traffic enforcer. I was wondering whether drivers can understand his sign or not. While working in NGO, almost every time I visit places, they prepared dance numbers and performed for us. From these examples, I notice there are less individual performers. They usually practice a dance and perform it as a group. Dance is still tool to express themselves but it go along with their social life. It is not about to express whatever individual want. Dance is not only owned by professional either people who love performing art. They grow up with these. Whatever reasons, I am quite enjoying to see their talents. It is narrative of Dutch summer school. Self-introduction- who am I? and what am I going to write? 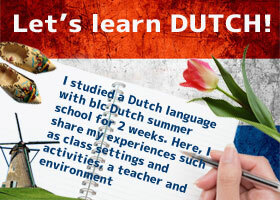 Why I need to learn Dutch?